The First Baptist Church at Bracebridge purchased the frame Primitive Methodist Church in 1887. In 1892 the building was bricked and an addition was built at the back in 1936. The building functioned as a church until 1989. 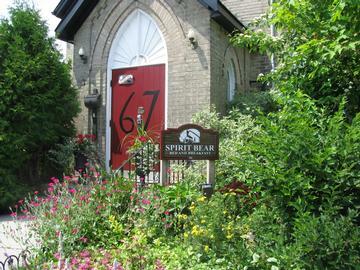 Since that time, the church has been converted to a home and now in 2007 to a bed and breakfast. In an effort to do our part for the environment,and to protect our natural resources, we use non-toxic cleaning products and make every effort to conserve water and electricity whenever possible. We will refresh your towels and linens only for stays longer than 2 nights, or upon request. We also offer locally grown food whenever possible and fair trade products. Our breakfasts are served in the Great Room and include hot and cold selections, fresh seasonal, and when possible, locally grown produce. We offer a daily special along with a basket of freshly baked goodies each morning. Complimentary cold beverages are available at all times in the Great Room. 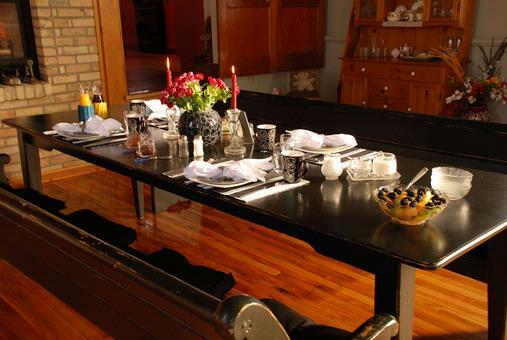 Please advise us of any dietary needs or allergies and we can accommodate you. 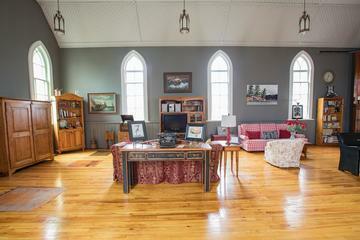 The Great Room, formerly the sanctuary of the church, is tastefully decorated with cozy seating areas, books, games and high speed wireless internet access. We have a large, bright bathroom with two sinks and a walk in shower. By request, an additional bathroom with a tub is available on the main floor. Call first please. As each room is equipped for 2 people. Babes with travel cribs are ok. Your hosts have two live-in pets although they would love the company,Eddie and Sadie are all we can handle!! There is no charge with 48 hours notice or if a vacancy can be rebooked. Otherwise, the amount equalling one nights' stay will be billed to your credit card. Absolutely no smoking in house or on the premises. Although we would love to host your pets, we have two lovable dogs of our own that you can "borrow" while you are here!